Audi releases a new promotional trailer for the 2012 S8 high-performance luxury sedan ahead of its official Frankfurt debut. Audi is intent on making a proper showing at this year&apos;s 2012 Frankfurt Auto Show. Considering the event is taking place in the automaker&apos;s vaterland, it&apos;s absolutely vital they bring their very best of the best in the face of stiff competition coming from the likes of BMW and Mercedes-Benz. Only two weeks ago did Audi unveil its new S6, S7 Sportback, and S8 ahead of their public debut at Frankfurt. And now Audi has released additional photos and a promotional trailer for their new S8 flagship. 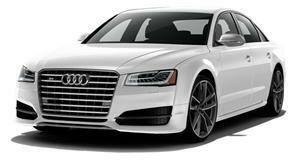 For those who don&apos;t recall, the 2012 S8 is powered by a new 4.0 TFSI twin-turbo V-8 with 520hp and 479 lb-ft of torque. It&apos;s mated to an eight-speed Tiptronic transmission and can go from 0 to 62mph in 4.2 seconds with an electronically-limited top speed of 155mph. Compared to the outgoing V10-powered S8, the new car has a 70hp increase thanks to added technologies such as recuperation and start-stop systems, cylinder deactivation, and direct-injection technology. Fuel consumption is also decreased by almost 23 percent. The interior is once again a place of Audi perfection and outstanding build quality. Official pricing hasn&apos;t been released, but Audi continues to remind us on the need to make some serious cash one day with this new video.